LOS ANGELES, California, January 18, 2011 (ENS) – An environmental group has filed a federal lawsuit against the Department of the Interior to halt construction of three solar power towers being built on public lands in the Mojave Desert. The Western Watersheds Project claims the Ivanpah solar power plant is destroying 5.4 square miles of high quality habitat for the threatened desert tortoise in eastern California near the Nevada border. “No project can be considered clean or green when it involves destruction of habitat for a species listed under Endangered Species Act on this scale,” said Michael Connor, California director for Western Watersheds Project. The site, located near Mojave National Preserve, provides habitat for 19 other rare animal species, said Connor, including desert bighorn sheep, golden eagles and burrowing owls, and several rare plants. There are stands of barrel cactus, and centuries-old Mojave yucca on the site. “The Department of Interior is tasked with siting energy projects in an environmentally sound manner. Instead it is allowing thousands of acres of important desert tortoise habitat to be bulldozed when there are alternative ways of generating power,” said Connor. The Ivanpah solar project is being built by BrightSource Energy, a private company based in Oakland, California. The 392 megawatt solar complex will use mirrors to focus the power of the Sun on solar receivers atop three towers. Completion of all three sets of mirrors and towers is expected by 2013. The electricity generated by all three plants is enough to serve more than 140,000 homes in California during peak hours. The company says the complex will reduce emissions of the greenhouse gas carbon dioxide by more than 400,000 tons per year. The $1.7 billion solar power project is underwritten with $1.3 billion in federal loan guarantees. Secretary of the Interior Ken Salazar approved the project in October. “That extension provides the federal defendants with a rare and invaluable opportunity – guided by this Court’s review – to address and rectify the significant errors and omissions that plagued their unduly hasty initial review of the Ivanpah Solar Electric Generating System Project whose approval is challenged herein,” the lawsuit states. Threatened by habitat loss, habitat degradation, disease, and predation by ravens and coyotes, the Mojave population of the desert tortoise was listed as threatened under the Endangered Species Act in 1990. Since then, populations have continued to decline. 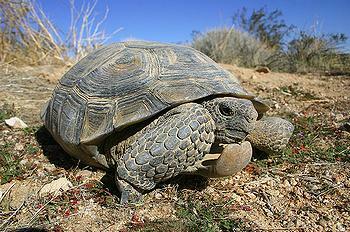 The Ivanpah Valley is inhabited by the most genetically distinct of the five recognized California desert tortoise populations. Desert tortoises on the Ivanpah power plant site are one of the highest elevation breeding populations known, and the area provides essential habitat connectivity through the mountain passes to desert tortoise populations in the neighboring valleys. Announcing approval of the project in October 2010, Secretary Salazar said there has been “extensive environmental review,” starting with public scoping in November 2007, followed by a draft environment impact statement and full public involvement in November 2009, and a supplemental draft EIS in April 2010. A final EIS was issued in August 2010. Salazar noted that in response to public comments BLM reduced the size of the project by 15 percent, from 4,073 acres down to 3,471 acres and the number of solar mirrors from 214,000 to 173,500. “Pursuant to a U.S. Fish and Wildlife Service approved plan, desert tortoises onsite will be tested for disease, translocated to suitable, comparable habitat and monitored. As part of BLM’s ongoing Desert Tortoise conservation plan, BLM has already set aside more than three million acres of habitat in California,” he said. But Western Watershed Project’s attorney Stephan Volker is not persuaded. “Virtually every significant environmental law was shortcut to shoehorn this destructive project into this ecologically irreplaceable site, despite the known availability of cheaper and better power sources including conservation, roof-top solar, and energy development in existing industrial zones,” he said Monday.